Laws are the products of the society which codifies and applies them  and which may eventually decide that they have become obsolete. 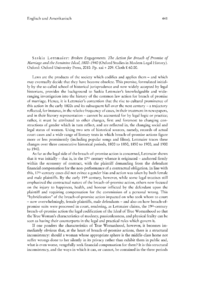 This premise, formulated initially by the so-called school of historical jurisprudence and now widely accepted by legal historians, provides the background to Saskia Lettmaiers knowledgeable and wide ranging investigation into the history of the common law action for breach of promise of marriage. Hence, it is Lettmaiers contention that the rise to cultural prominence of this action in the early 1800s and its subsequent fall over the next century  a trajectory reflected, for instance, in the relative frequency of cases, in their treatment in newspapers, and in their literary representation  cannot be accounted for by legal logic or practice; rather, it must be attributed to other changes, first and foremost to changing constructions of gender which in turn reflect, and are reflected in, the changing social and legal status of women. Using two sets of historical sources, namely, records of actual court cases and a wide range of literary texts in which breach-of-promise actions figure more or less prominently (including popular songs and films), Lettmaier traces these changes over three consecutive historical periods, 1800 to 1850, 1850 to 1900, and 1900 to 1940.